Reproduced from James A Williamson The Cabot Voyages and Bristol Discovery Under Henry VII. (Cambridge University Press) 1962, 212-214. John Day was an English merchant in the Spanish trade. 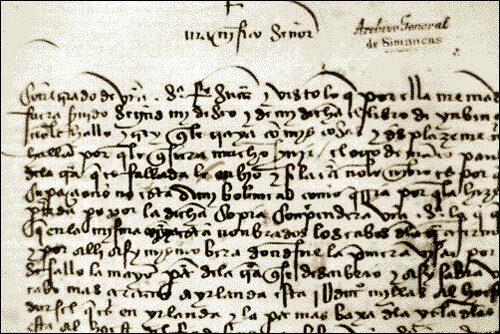 He wrote this letter in Spain between December 1497 and January 1498 to the "Lord Grand Admiral", probably Christopher Columbus. Discovered in 1956 in the Archivo General de Simancas, the letter contains information which adds significantly to the stock of knowledge concerning the Cabot voyages. This letter was written by the English merchant John Day to an unidentified Spanish 'Lord Grand Admiral' who is believed to have been Christopher Columbus. Your Lordship's servant brought me your letter. I have seen its contents and I would be most desirous and most happy to serve you. I do not find the book Inventio Fortunata, and I thought that I (or he) was bringing it with my things, and I am very sorry not [to] find it because I wanted very much to serve you. I am sending the other book of Marco Polo and a copy of the land which has been found [by John Cabot]. I do not send the map because I am not satisfied with it, for my many occupations forced me to make it in a hurry at the time of my departure; but from the said copy your Lordship will learn what you wish to know, for in it are named the capes of the mainland and the islands, and thus you will see where land was first sighted, since most of the land was discovered after turning back. Thus your Lordship will know that the cape nearest to Ireland is 1800 miles west of Dursey Head which is in Ireland, and the southernmost part of the Island of the Seven Cities is west of Bordeaux River, and your Lordship will know that he landed at only one spot of the mainland, near the place where land was first sighted, and they disembarked there with a crucifix and raised banners with the arms of the Holy Father and those of the King of England, my master; and they found tall trees of the kind masts are made, and other smaller trees, and the country is very rich in grass. In that particular spot, as I told your Lordship, they found a trail that went inland, they saw a site where a fire had been made, they saw manure of animals which they thought to be farm animals, and they saw a stick half a yard long pierced at both ends, carved and painted with brazil, and by such signs they believe the land to be inhabited. Since he was with just a few people, he did not dare advance inland beyond the shooting distance of a crossbow, and after taking in fresh water he returned to his ship. All along the coast they found many fish like those which in Iceland are dried in the open and sold in England and other countries, and these fish are called in English 'stockfish'; and thus following the shore they saw two forms running on land one after the other, but they could not tell if they were human beings or animals; and it seemed to them that there were fields where they thought might also be villages, and they saw a forest whose foliage looked beautiful. They left England toward the end of May, and must have been on the way 35 days before sighting land; the wind was east-north-east and the sea calm going and coming back, except for one day when he ran into a storm two or three days before finding land; and going so far out, his compass needle failed to point north and marked two rhumbs below. They spent about one month discovering the coast and from the above mentioned cape of the mainland which is nearest to Ireland, they returned to the coast of Europe in fifteen days. They had the wind behind them, and he reached Brittany because the sailors confused him, saying that he was heading too far north. From there he came to Bristol, and he went to see the King to report to him all the above mentioned; and the King granted him an annual pension of twenty pounds sterling to sustain himself until the time comes when more will be known of this business, since with God's help it is hoped to push through plans for exploring the said land more thoroughly next year with ten or twelve vessels-because in his voyage he had only one ship of fifty toneles and twenty men and food for seven or eight months-and they want to carry out this new project. It is considered certain that the cape of the said land was found and discovered in the past by the men from Bristol who found 'Brasil' as your Lordship well knows. It was called the Island of Brasil, and it is assumed and believed to be the mainland that the men from Bristol found. Since your Lordship wants information relating to the first voyage, here is what happened: he went with one ship, his crew confused him, he was short of supplies and ran into bad weather, and he decided to turn back. Magnificent Lord, as to other things pertaining to the case, I would like to serve your Lordship if I were not prevented in doing so by occupations of great importance relating to shipments and deeds for England which must be attended to at once and which keep me from serving you: but rest assured, Magnificent Lord, of my desire and natural intention to serve you, and when I find myself in other circumstances and more at leisure, I will take pains to do so; and when I get news from England about the matters referred to above-for I am sure that everything has to come to my knowledge-I will inform your Lordship of all that would not be prejudicial to the King my master. In payment for some services which I hope to render you, I beg your Lordship to kindly write me about such matters, because the favour you will thus do me will greatly stimulate my memory to serve you in all the things that may come to my knowledge. May God keep prospering your Lordship's magnificent state according to your merits. Whenever your Lordship should find it convenient, please remit the book or order it to be given to Master George.